That scene was filmed at the ultimate New York deli – Katz’s on Manhattan’s Lower East Side in New York City. Since my husband and I consider that “our movie” (we were married the year it was released) I made a beeline to Katz’s about 10 years ago, but only to see the famous table. Guess you could say that I “only went to get the ‘gram” even though it was pre-Instagram. Somehow, “I only went to get the Flickr pic” doesn’t have the same ring. Anyway, I never actually ate at Katz’s, so it was time to fix that on a recent trip with my son, after seeing those New York icons the Statue of Liberty and Ellis Island. 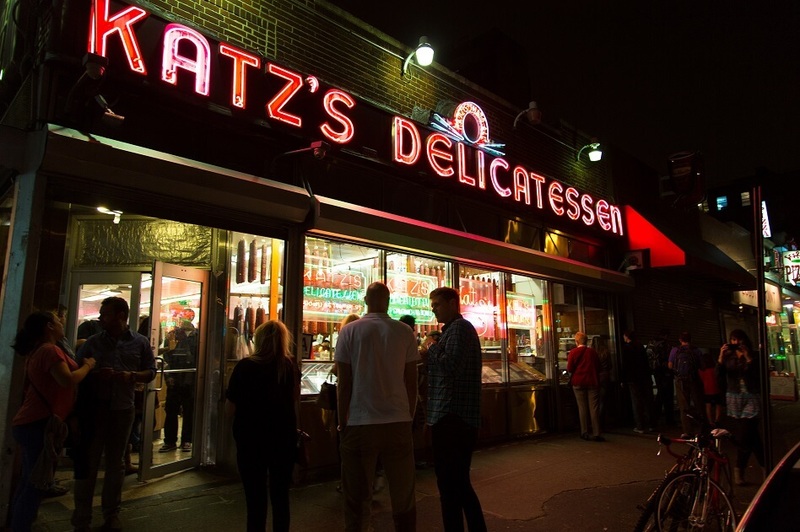 The Katz’s menu is extensive, but we wanted to order the most “New York deli” items possible. No, it didn’t include the famous pastrami … “smoked to juicy perfection and hand carved to your specifications. 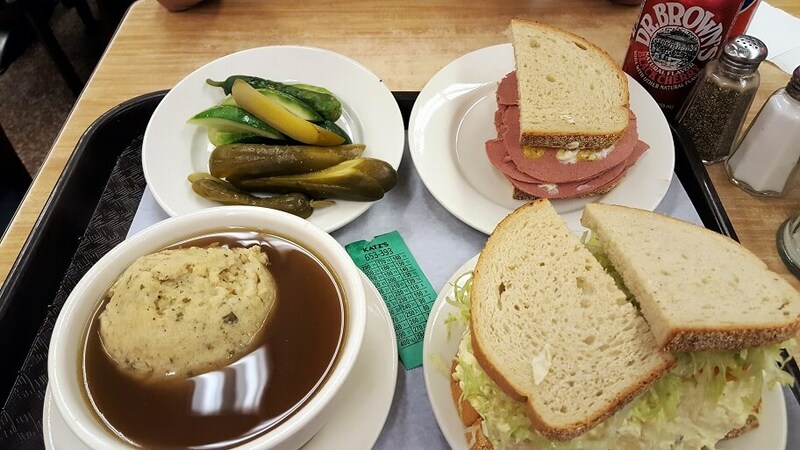 Ask for mayo at your own peril.” … but we went for liverwurst, egg salad, and matzo ball soup. The prices are high – around US$20 for a sandwich – but the portion sizes are INSANE. My order was a half sandwich plus the matzo ball soup, and I could not finish it all. You can choose from lots of different sandwiches (corned beef, turkey, a Reuben, salami, knoblewurst/garlic beef sausage,) blintzes, noodle kugel, knishes, and there’s breakfast as well, including choices like a pastrami or tongue omelet. We lucked out on the day we visited; the “Harry Met Sally” table opened up right as we placed our order at the counter, and don’t you know I raced over there to claim it. Here it is, with my son eating his egg salad sandwich and wondering why I was so gleeful…. 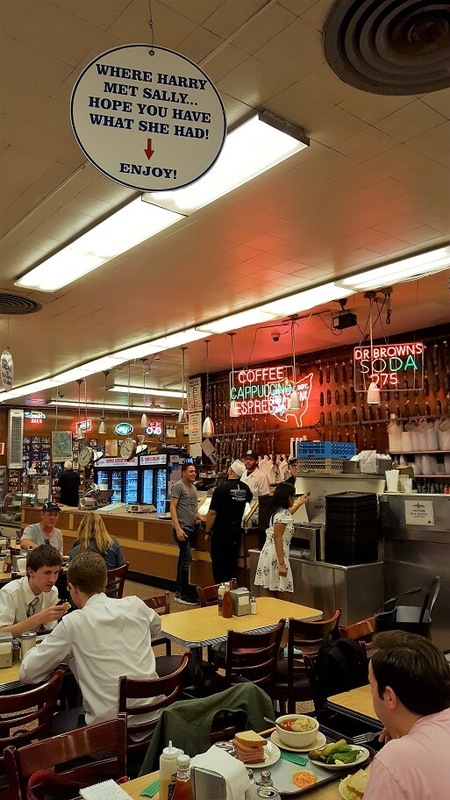 Katz’s has been there for decades, anchoring the heart of what was the largest Jewish immigrant neighborhood in the city. Check for tours and events with the Lower East Side Jewish Conservancy, and do not miss the outstanding Lower East Side Tenement Museum nearby.